It’s been a great day over here at Chasing Mailboxes. First, yesterday’s post about Capital Bikeshare was featured on DCBlogs. Second, I learned that I have a collaborator on my rapidly unfolding cupcaking commuting research project. My new partner in cupcake commuting research is fellow D.C.-area cyclist and blogger, Freewheel. What a relief! I’d hate to think I had to do all these experiments alone. Freewheel gives a full run-down of his own experiment, “Rising to the Cupcake Challenge,” which also used Lavender Cupcakery cupcakes, here. There were a few differences between Freewheel’s and my experiments. I used the two-cupcake to-go container. Freewheel chose the four-cupcake container (for science, I’m sure). I stowed my cupcakes in my rear Carradice bag. Freewheel placed his cupcakes on a rear rack, wrapped the box in bubble wrap, and secured the box using his Pletscher “rat trap” rack. I conducted my experiment in the last days of summer. Freewheel conducted his in the waning days of winter. At least, I hope they’re waning. He has to eat four battered cupcakes. I only had to eat two. Freewheel’s cupcakes are less melted than mine. I attribute this to his having conducted his experiment in February. One of the big questions I have for Freewheel is why he decided that the bubble wrap would work better on the outside of the box. When I look at the image above as well as his own photo, it would seem to me that the bubble wrap would provide more benefit inside the to-go container. Based on his post, he wrapped the box in bubble wrap to protect it. But isn’t protecting the cupcake the most important? Is it a chicken and egg issue? You tell me. Freewheel’s post concludes with a determined “This isn’t over!” It is so not over. We will uncover the secrets of successful cupcake commuting. We have to, for science. Who’s with us? I think you should try this with 6 cupcakes. Nothing like a half dozen mess o’cupcakes to make up for a nasty headwind. Of course, we at the Rootchopper Institute are always willing to help with clean up. Thank you for continuing to dedicate yourself to this scientific inquiry! To answer your question, I used the bubble wrap to cushion the box from the shocks of the road. I suppose you could use bubble wrap inside the box to hold the cupcakes in place, but my bubble wrap was not sterile enough to mix with food. 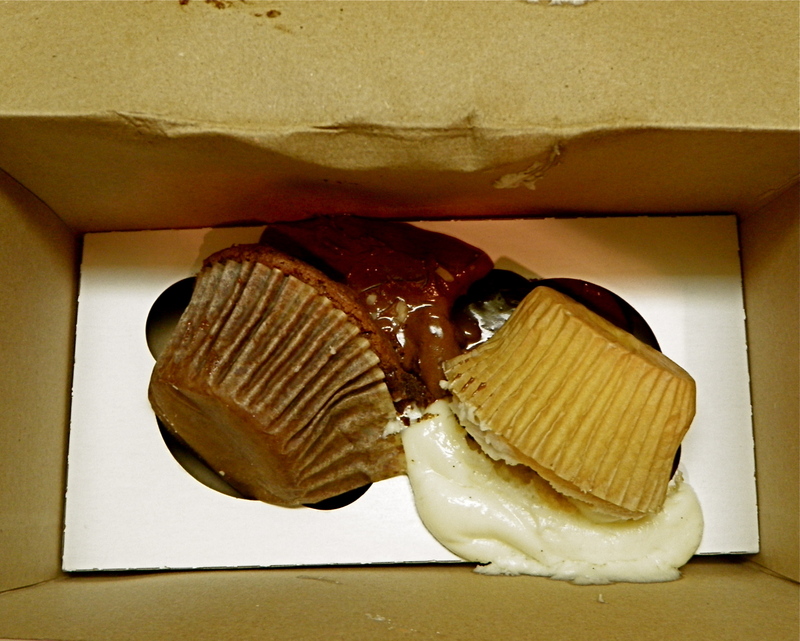 Actually, I thought the box itself would do the trick, because it has cardboard dividers to hold the cupcakes in place. Obviously not! Some kind of additional buffer is needed to hold these tasty cupcakes in place. 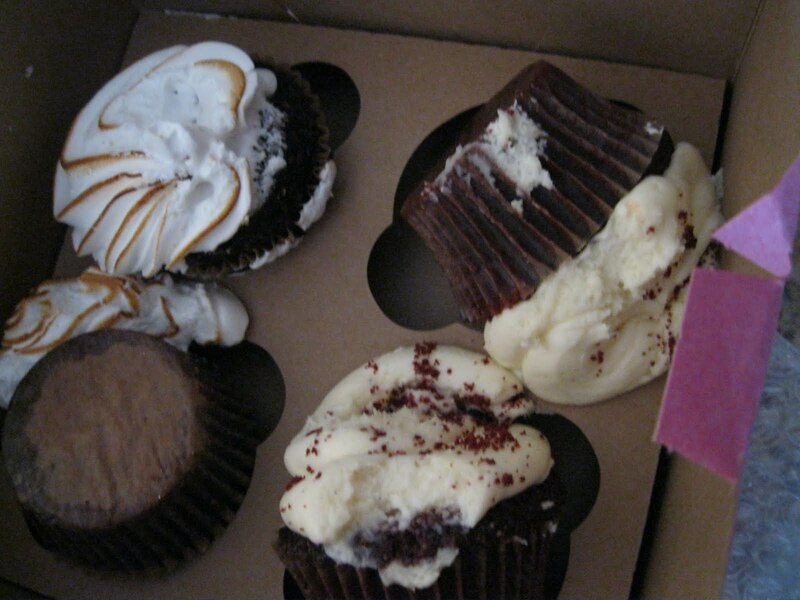 BTW, the battered cupcakes I was carrying were not eaten by me, but by the rest of the family. Interestingly, no one complained. i’ve never moved cupcakes by bike but maybe drop the cupcakes into some disposable cups that ensure a snug trip for the cupcake. Get some lids too. Wedge the cups into a safe part of you bag. Cut the cups to free the cakes!